More than 50 years ago, famed architect Frank Lloyd Wright walked the Arizona State University campus in Tempe with then-ASU President Grady Gammage. At the time, Gammage was looking for a way to make ASU a cultural center for the Phoenix area. Wright, meanwhile, had recently designed an opera house for Iraq's King Faisal II, but the king had been assassinated before the building could be constructed, and Wright was looking for a new use for the design. At one point, Wright put down his cane and said he had found the place where he would build a building with outstretched arms that said, "Welcome to ASU." That building became Grady Gammage Memorial Auditorium, which begins its 50th-anniversary season this month. Neither Gammage nor Wright lived to see the building completed, but Colleen Jennings-Roggensack says both would be proud of how the building (since rebranded as ASU Gammage) has evolved. "What's happened in the last 50 years is exactly what they thought would happen," says Jennings-Roggensack, who has been ASU Gammage's executive director since 1991. "It's become the leading cultural center in the Southwest and the leading Broadway touring house in the country." Interestingly, she adds, Wright once said that all of his buildings should fall down after 50 years. 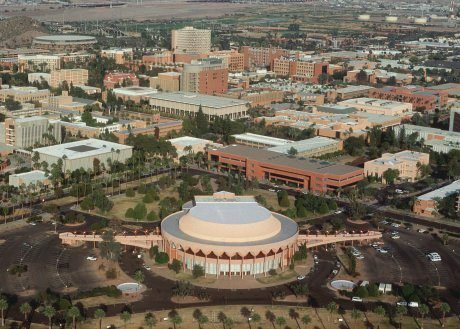 But thanks to Gammage's continuing evolution, it's remained relevant and become an important part of the identity of ASU and the Phoenix area. That's even more remarkable when you consider that the venue receives no financial support from the university. Jennings-Roggensack helped bring Broadway shows to Gammage; the first time The Phantom of the Opera came there, it sold out in seven minutes. That change required extensive renovations to the Gammage stage, as well as the addition of ramp systems and accessible seating for disabled patrons. A national study showed that Broadway shows at Gammage pump $50 million into the local economy each year, Jennings-Roggensack says. Gammage has been a place for political theater, too: A 2004 presidential debate between President George W. Bush and Sen. John Kerry was held there. Before that, in 1998, 30 sitting U.S. senators and former first lady Nancy Reagan came to Gammage for the funeral of Arizona's Sen. Barry Goldwater. And President Bill Clinton first gave his "Bridge to the Future" speech from one of Gammage's trademark arms. A residency by Aaron Landsman, an actor, writer and director who has performed around the world. There's plenty more to say about ASU Gammage, but it's a venue that you really should experience for yourself. For information about upcoming shows and other events, call 480-965-3434 or visit www.asugammage.com.